1 What are Seismic Waves? 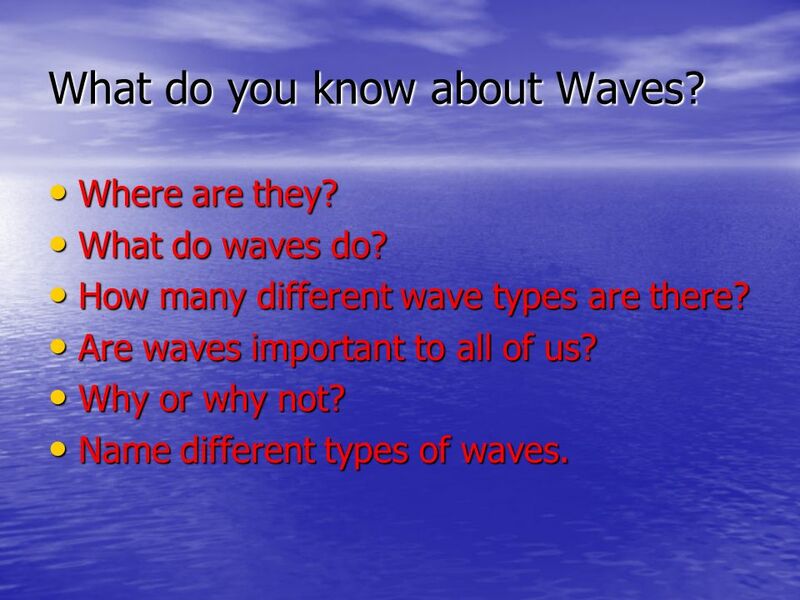 2 What do you know about Waves? Where are they? What do waves do? How many different wave types are there? Are waves important to all of us? Why or why not? Name different types of waves. 4 Seismic Wave Seismic waves are the waves of energy caused by the sudden breaking of rock within the earth or an explosion. They are the energy that travels through the earth and is recorded on seismographs. There are several different kinds of seismic waves, and they all move in different ways. 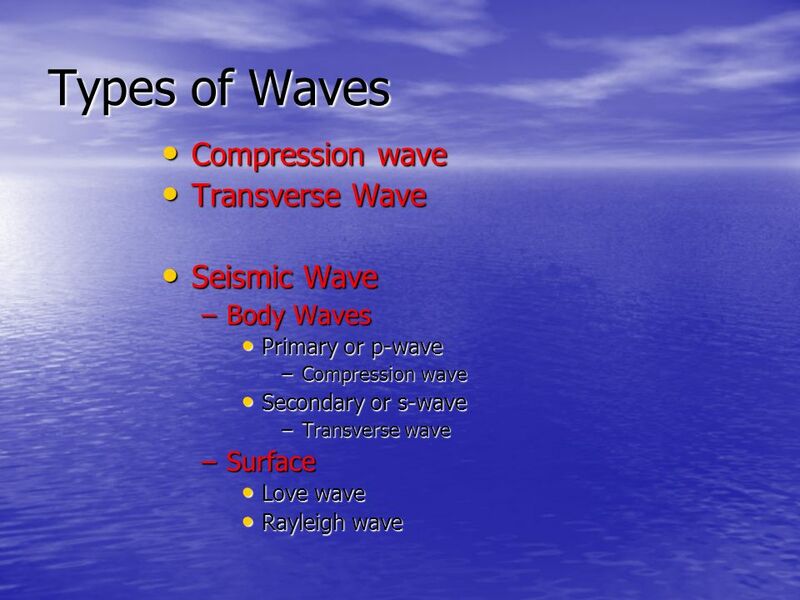 The two main types of waves are body waves and surface waves. The first kind of body wave is the P wave or primary wave. This is the fastest kind of seismic wave. The P wave can move through solid rock and fluids, like water or the liquid layers of the earth. It pushes and pulls the rock it moves through just like sound waves push and pull the air. 6 Stop and Think Have you ever heard a big clap of thunder and heard the windows rattle at the same time? 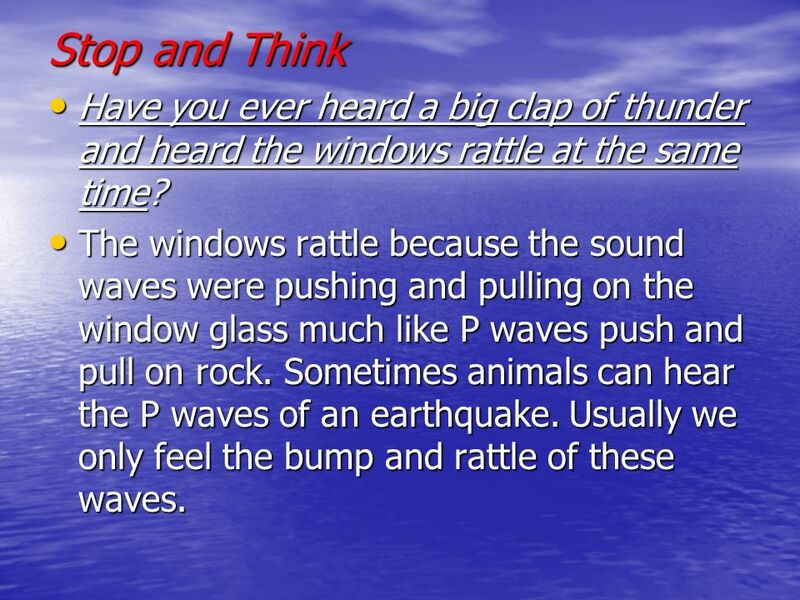 The windows rattle because the sound waves were pushing and pulling on the window glass much like P waves push and pull on rock. Sometimes animals can hear the P waves of an earthquake. Usually we only feel the bump and rattle of these waves. 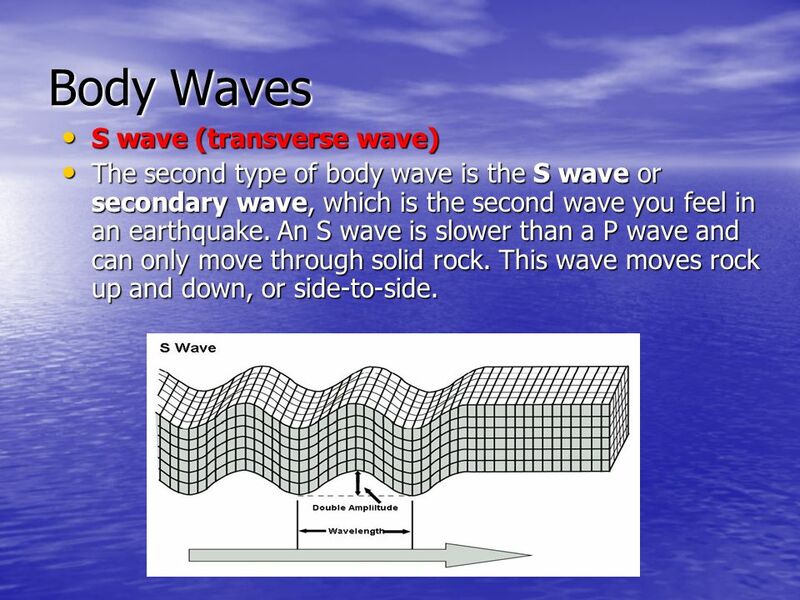 The second type of body wave is the S wave or secondary wave, which is the second wave you feel in an earthquake. An S wave is slower than a P wave and can only move through solid rock. This wave moves rock up and down, or side-to-side. 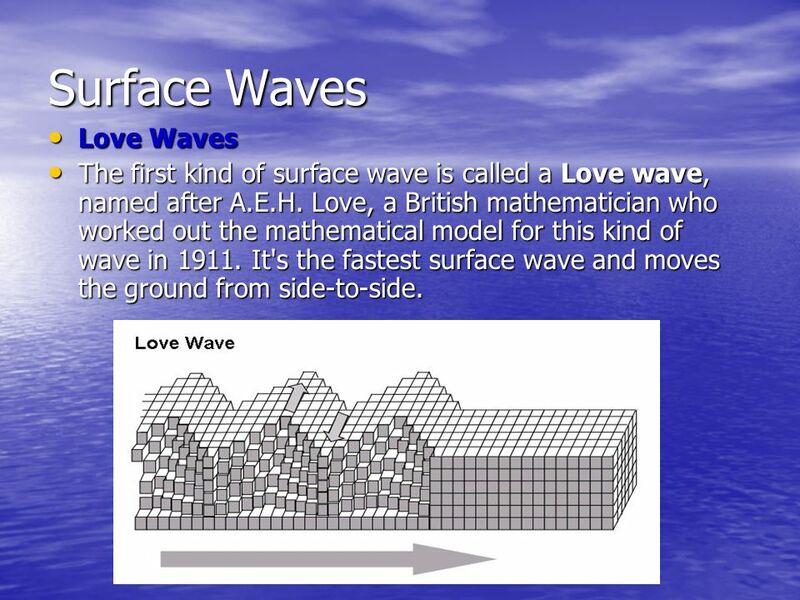 The first kind of surface wave is called a Love wave, named after A.E.H. Love, a British mathematician who worked out the mathematical model for this kind of wave in It's the fastest surface wave and moves the ground from side-to-side. 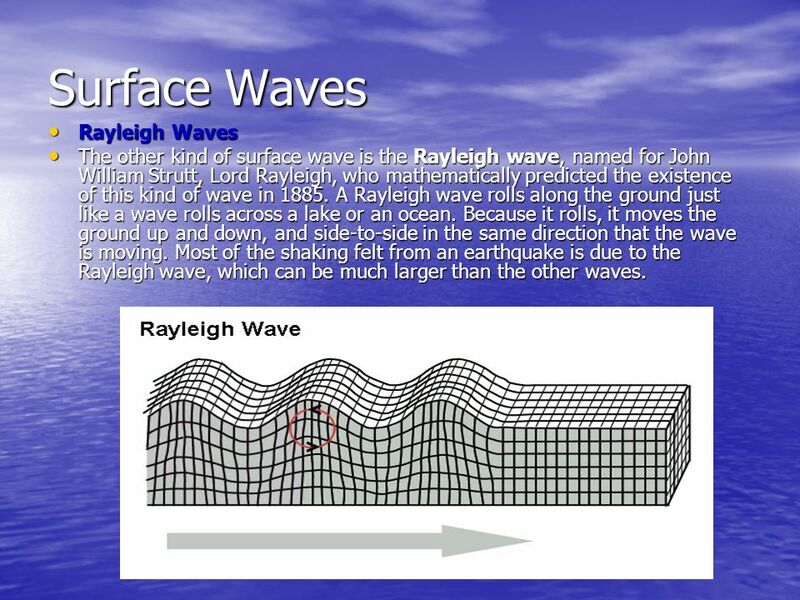 The other kind of surface wave is the Rayleigh wave, named for John William Strutt, Lord Rayleigh, who mathematically predicted the existence of this kind of wave in A Rayleigh wave rolls along the ground just like a wave rolls across a lake or an ocean. Because it rolls, it moves the ground up and down, and side-to-side in the same direction that the wave is moving. Most of the shaking felt from an earthquake is due to the Rayleigh wave, which can be much larger than the other waves. 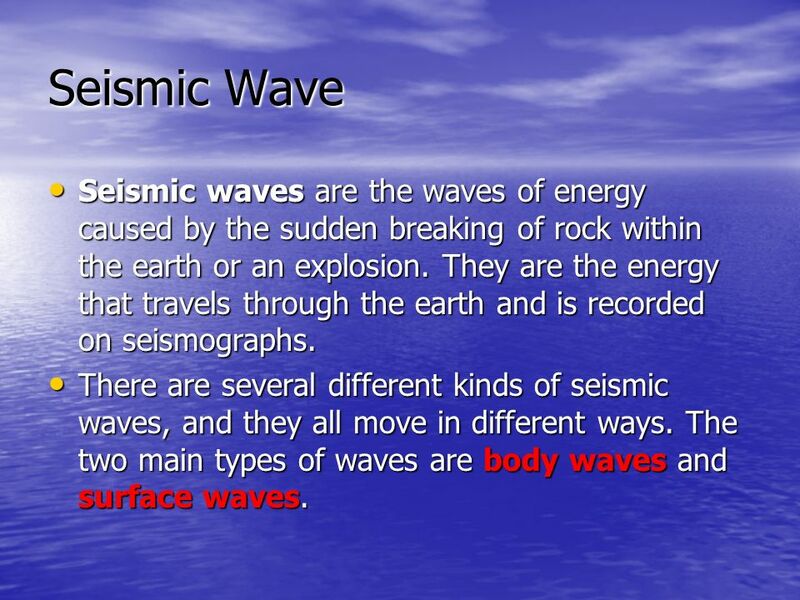 Download ppt "What are Seismic Waves?." 8.6.2 Waves Explain how seismic waves provide scientists with information about the structure of Earth's interior. What are Seismic Waves?. 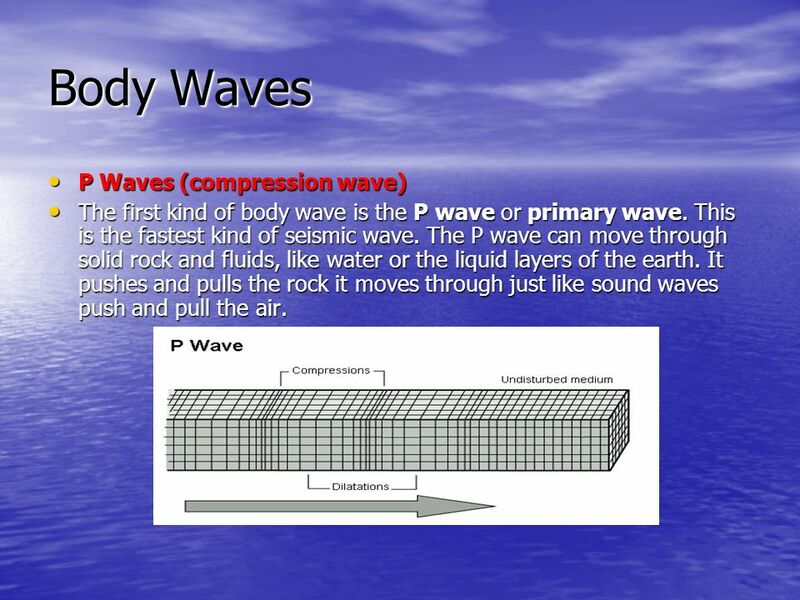 Types of Waves Compression wave (longitudinal) Transverse Wave Seismic Wave – Body Waves Primary or p-wave Primary or p-wave. Seismic Waves Generate outward from focus. P Waves Compress and expand ground Travel fastest – first to arrive at seismic reporting station Travel through.  Waves of energy that travel through the earth after rock has been elastically deformed 1. The crust layer is stressed and begins to deform 2. If the. 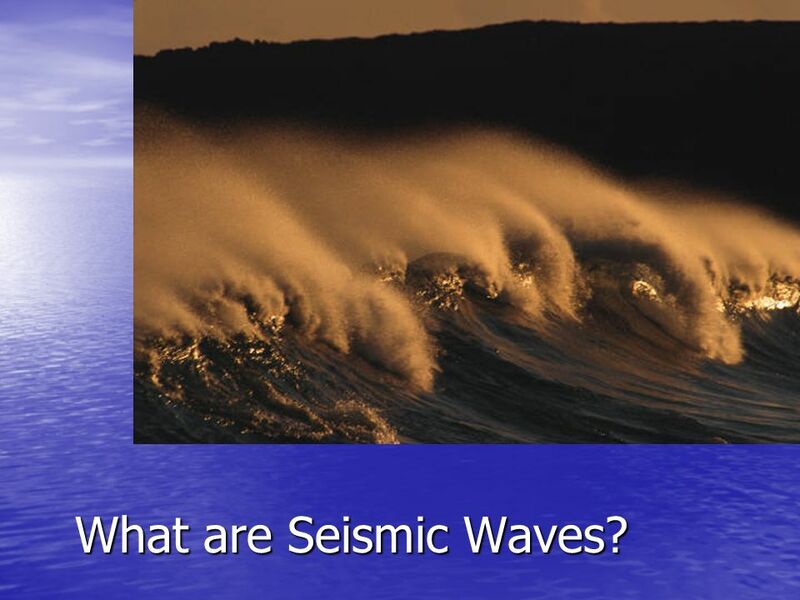 Seismic Waves EQ: How do I describe and identify different types of seismic waves? Snap Your Fingers and observe what is happening. When you snap your fingers, imagine that each finger is a big chunk of rock deep inside the earth's. Bellringer Name an example of real-world folded mountains. Seismic waves and the shadow zone.  Sudden release of energy in the Earth’s crust and creates seismic waves. Occurs naturally or human induced.   The word comes from the Greek word seismic, for shaking.  It is the branch of Geology which has provided the most comprehensive interpretation of. Wave Type (and names) Particle MotionOther Characteristics P, Compressional, Primary, Longitudinal Dilatational Alternating compressions (“pushes”) and. Earthquake Waves Learning Target: How does the energy from plate movement make earthquakes? Seismology: ●What is Seismology? ●What are Seismic Waves? : Types of Seismic waves ●Where do Earthquakes Happen? ●Why do Earthquakes Happen? ●How is the. EARTHQUAKES BY: 10 GRADE. WHAT IS AN EARTHQUAKE ? Simply, earthquakes are the rumblings, shaking or rolling of the earth's surface. It is usually what. Measuring Earthquakes. Seismograph Or seismometer, is an instrument used to detect and record earthquakes.  The shaking or trembling caused by the sudden release of energy.  Usually associated with faulting or breaking of rocks. Earthquake Ground shaking caused by the sudden and rapid movement of one block of rock slipping past another along fractures in Earth’s crust called FAULTS.